OCTOBER 24--Arkansas cops are stumped as to why an accused shoplifter was wearing a Holstein cow costume when she recently swiped allergy medicine from a Walmart store. 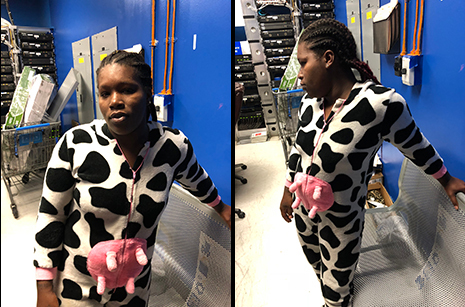 Police in Pine Bluff, a city 40 miles south of Little Rock, were at the store Tuesday afternoon as Walmart workers monitored suspect Ashley Curry, who “was dressed as a black and white Holstein cow, complete with four pink udders in her lower abdomen area,” according to an arrest report. While under surveillance, Curry, 27, allegedly hid a package of Flonase in her coat pocket and headed for the store exit. As she departed the retailer, Curry was met by a Pine Bluff Police Department patrolman and a Walmart loss prevention officer, who then escorted Curry and a male companion back inside. En route to the security office, Curry reportedly tussled with Officer William Wiegand as she sought to dart into a bathroom and remove her coat. 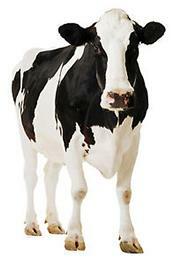 “I was then able to grab her by the Holstein cow costume and stop her,” Wiegand reported. As seen above, Curry was photographed while in custody at Walmart. 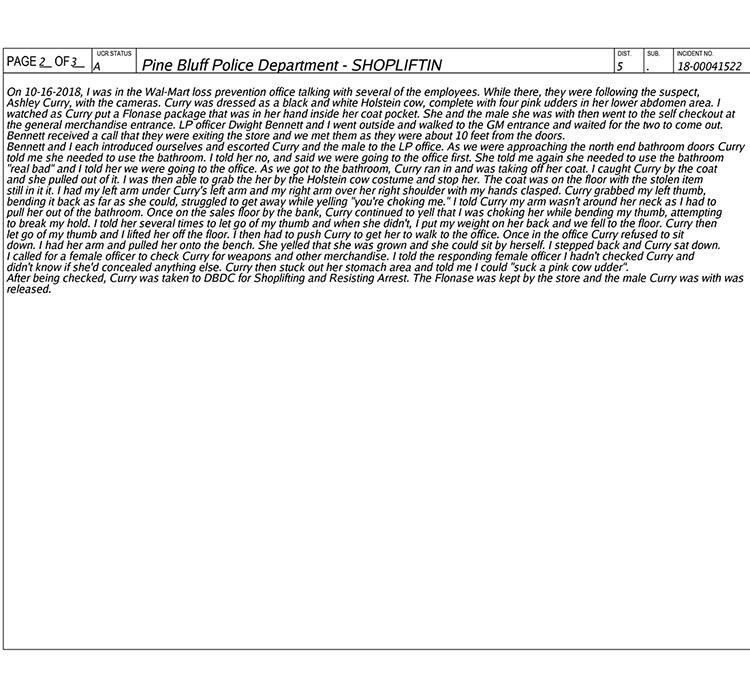 Curry was busted for shoplifting and resisting arrest and booked into the Jefferson County jail on the misdemeanor counts. She is next scheduled for an October 30 court hearing.